Bishop Phonsie Cullinan on Monday apologised for his comments on the use of the human papilloma virus (HPV) vaccine, admitting he had not been “fully informed” about the matter when he made his intervention. Apologising for contributing misinformation to the discussion or causing upset, he said he was solely motivated to protect people from the HPV. However, he admitted he was “not fully informed about the vaccination programme” and added that he could now see how HPV vaccines can “contribute greatly to lowering the rate of cervical cancer”. His statement was welcomed by a spokesman for the Association of Catholic Priests, Fr Brendan Hoban, who described it as “abject”. The Co. Mayo parish priest said that while this may have been difficult for the prelate, it was both “welcome and necessary”. “It’s clear that a more informed and sensitive approach is needed if the life-saving work of medical personnel is not to be undermined or the reputation of the Catholic Church not to be further damaged,” Fr Hoban said. Last week, the Bishop of Waterford and Lismore questioned the effectiveness of the Gardasil HPV vaccine and suggested that it was encouraging sexual activity among young people. He also claimed that the vaccine was “70 per cent safe”. “The vaccine covers 70 per cent of cervical cancers. Would you go on a plane that was 70 per cent safe? Smear tests will still be necessary,” he said. HPV (Human Papillomavirus) is a sexually transmitted infection many men and women contract. In women, HPV can cause changes in the cervix that can lead to cervical cancer. The vaccine is designed to prevent women developing cervical cancer in this way. 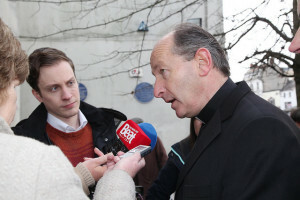 Among those who criticised the Bishop’s comments were the Minister for Health Simon Harris, who described them as “ignorant” and “unhelpful”. A spokesman for the HSE said the Bishop’s claim “simply flies in the face of best available medical and scientific evidence”. “He has chosen certain statistics and repackaged them in a way to suit his particular narrative. His miscommunication of information in this way puts the health and lives of women in Ireland at risk. This is unacceptable for a person in his position,” the HSE spokesman said. In a statement issued ahead of the Bishop’s apology, the Association of Catholic Priests (ACP) criticised the Bishop’s comments, warning that they were not just “idiosyncratic” but also “ill-informed and dangerous”. The group, which represents over 1,000 priests, said the comments “bring the Irish Catholic Church into further disrepute, suggesting a nonchalance about women’s health and an obsession with sexuality”.